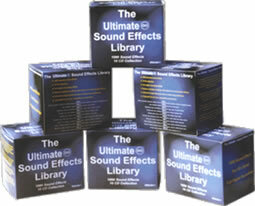 Blue Revolution brings you The Ultimate Sound Effects Library containing 1000 Sound Effects over 10 CDs. Available on a low one-time buy-out basis, meaning you won't ever have to pay usage fees; The Ultimate Sound Effects Library is the most cost-effective collection of SFX available. Recorded & mastered digitally for the ultimate sound quality, these sound effects are perfect for use in commercials, podcasts, promos, films, video or multimedia presentations. WAS £199... NOW ONLY £99! Polina Nazarova, European Hit Radio, Riga, Latvia. Chris Jarrett, Radio Turks & Caicos, Caribbean.